KINGSTON, ONTARIO -- Armed with will and determination, the Tragically Hip embarked 30 years ago on a rock 'n roll journey that has taken them around the world and across Canada more times than the band members can remember. Those trips have resulted in songs and lyrics that will forever resonate with the group's devoted fan base. "At the Hundredth Meridian," "Last American Exit," "As I Wind Down the Pines" and "Silver Jet" -- with its continent-binding lyric about flying "from Clayoqout Sound to Cape Spear" -- are only a handful of the Hip's songs that reference Canadian geography and a sense of the nation's vastness. Another travel-inspired tune is "Broken Road," which appears on guitarist Paul Langlois' solo album, "Fix This Head." The song was written "while I was in the middle of doing a lot of driving for these guys," says Langlois, whose lyrics speak of being 700 miles away and homesick for Cataraqui -- the river that flows through the Hip's hometown of Kingston, Ontario. It recalls the quintet's early days in the '80s when they toured the country in a van, not the luxury bus or airline flight that takes them from stop to stop these days. "Travel is a big part of lucky people's lives. We're lucky enough to travel. I'm quite happy to know the country pretty well. 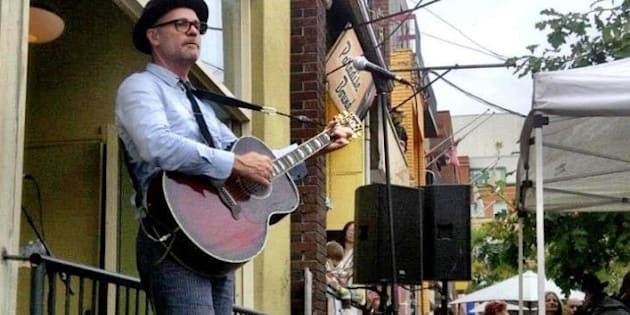 Certainly not all the areas, but the places along the highways for sure," Langlois said after a performance of his own songs at Kingston's Market Square in August that featured Hip bandmates Robby Baker and Gord Sinclair on stage while Gord Downie watched with the rest of the crowd of about 400 people. "Every writer is different, but i think travel's a big part of a lot of songwriters' lives because you do that so often and it does influence your outlook on the world." Watch a video of the Hip's members talking about travelling Canada and continue reading the rest of this story at Vacay.ca. Click here to see Vacay.ca on Huffington Post.